Dermal Fillers consist of Hyaluronic Acid (HA), which provide very predictable results, accurately and with very few potential side effects. This is a substance that is naturally present as a vital component of our skin, eyes and joints. Like collagen and elastin, HA is lost as we get older, resulting in a loss of volume and support for the skin, which causes sagging, grooves and lines on the face. In addition to restoring volume, HA is very hydrating and can improve the condition of the skin. 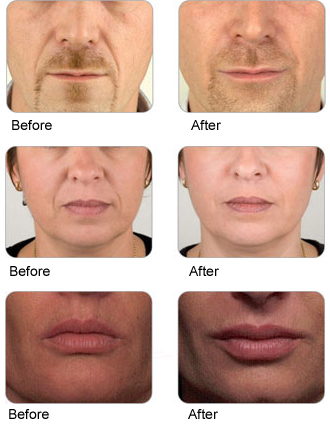 By injecting Dermal Fillers, we can restore this volume and smooth out various depressions to regain a more youthful appearance or correct various defects like thin, asymmetrical lips. Collagen was the most common dermal filler used but it is used less often today. The newer options are safer and the effects last longer. Dermal Fillers will be administered under local anesthetic at Project Physique and we use one of the most advance brands, Teosyal®. Treatment results are seen immediately but are temporary, lasting between 3-12 months before normal contours return. Before and after images courtesy of Teosyal. Results can vary from person to person and are not guaranteed. - Control over lip volume. The amount of substance injected can be controlled, so the clinician has better control over how much lip volume is created. - Gradual pace of treatment. The injections can be given gradually during different appointments until the desired results are achieved. - Bumps dissolve easily. Any lumps and bumps created by movement of the lips can be resolved easily. - Less bruising. There may be less bruising and swelling compared to other dermal fillers. - Reasonably lasting results. The results are reasonably long-lasting, but not permanent. - Allergic reaction unlikely. Because hyaluronic acid fillers are made from substances similar to those found in the body, they are unlikely to cause an allergic reaction.